While on holiday recently in Heimbach in the Eifel, I decided to take a weekend workshop in the Internationale Kunstakademie in Burg Hengebach. As it was told to me, the town was given back the castle a few years ago and had to make it pay, and so the Kunstakademie was started. It appears to be going from strength to strength, which is good to see. This was my second course there and I have enjoyed learning new skills in both. The course I attended back in July was given by Heinz Zanger, and involved a morning of learning techniques and an afternoon of sketching within the Burg on the first day, and then development of drawings into watercolour on the second day. I chose to draw the view within the walls of the Burg (below) because it encompasses several levels, connected by stairs and a path and I like the curves that recur in the image. Below is the initial sketch which I annotated in order to record notes about the light (mid-afternoon on a blustery sunny day with high cloud). The light at this time of day is coming from the left. My tutor was actually quite impressed by the level of documentation and this drawing is going to appear in an exhibition as an example of good preparation for painting! I hope noone asks why the painting isn’t there, too! On the second day, which was cooler and windier with dark clouds (although it didn’t rain until the evening), I began by creating a tonal drawing on a small piece of watercolour paper using a dilute wash of something that might have been carmine. Having prepared everything the evening before, I now had to rethink because it was morning and the light was quite different. I added a minimal ultramarine wash to the sky to get a sense of the clouds, which were still white and billowing at this stage. The image below can be made out by reference to the one above. The paper has been inadvertently folded within the sketchbook. I began the A3 painting in a similar way, with an overall wash for the buildings in the same pink tone. If I were doing this again today, I would not start like this. I include the painting below as part of the “warts and all” learning process, not because I think it is any good… Part of the reason that I did this was because, at the start, there was blue sky against which the sandstone structure appeared bright. However, as the clouds developed, the whole thing developed a dull appearance that did not improve as I plodded on adding yet more paint… The proportions are also incorrect: the house on the left should be taller and thinner and the keep should also be a bit taller. The cobalt blue clouds are realistic but the whole thing feels heavy and dead, even though there are a few patches of light to relieve this. I quite like the archway on the right, which seems to have a lightness and delicacy that relieves the density of the buildings next to it. It is a castle and it should appear solid but the approach is all wrong. i wanted to see what had gone wrong and how I could avoid making the mistakes again. Once back home, I picked up a book by Linda Kemp entitled “Watercolour Painting outside the Lines“, which focuses on negative space. I decided to apply these principles in an exercise, using the Burg as my subject. I used an offcut of watercolour paper which had already been used – hence the red roses on the upper right! – and drew the Burg in contour with a green water-soluble gel pen. I added some complementary red wash to capture the shadows and added windows. Other than that, I did not add anything to the positive space, but rather used the negative space and shadows to imply form. I added a few purple clouds for extra colour and to distract attention from the roses! 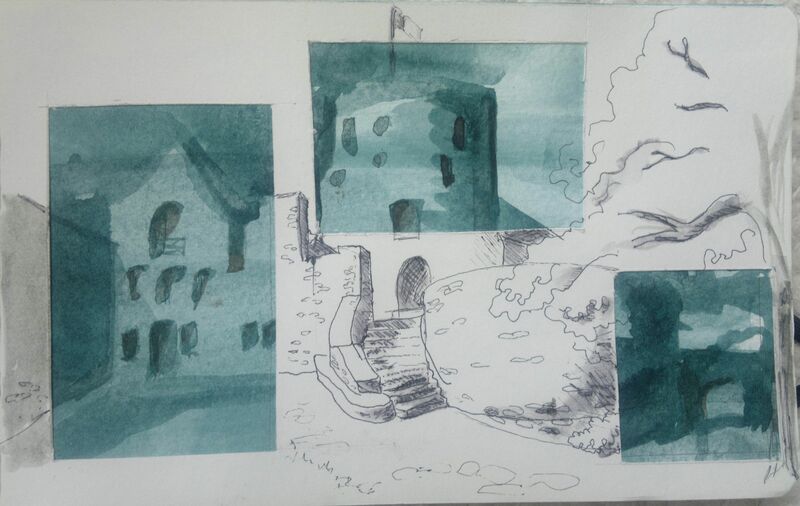 Although this exercise was performed rather crudely and there are errors, notably at the top of the steps, it showed me where I had gone wrong with the painting: focusing on the negative space and shadows would have allowed the Burg to “paint itself”. I tried this once more using a blue-green ink on watercolour paper. It was a bit heavy-handed and the ink was much too dark for my liking. I did not like the result overall but liked parts of it. I selected the most interesting parts that had worked best and then created a stencil which covered up the rest. I pasted the stencil on top and then redrew the castle around it. I am still not sure what I think of the product. However, I still like the areas of green, which now appear to contain more light, than when they were part of a dreary single green image. I would use this technique again, perhaps as part of a more complex collage, but I would not cut straight edges. Rather, I would wet the edges that I wanted to use for the inner frames and tear these carefully to create softer edges that would blend better with the surrounding image. The second drawing that I made in the Burg was of the Wehrgang, a sheltered walkway that leads from the entrance courtyard to the little library above the entrance, which we were privileged to visit later. I chose the subject because of the excellent pattern of shadows on the floor and lefthand wall (as viewed) due to the late afternoon sun slanting through the supporting wooden beams on the right. There was also a handy seat in a niche at the end of the Wehrgang! Overall, I am pleased with the drawing, which creates a sense of the walkway curving away from the viewer as it approaches the library (part of the door just visible at the end – if you know what you are looking for!). There is a strong sense of the direct afternoon light. The following afternoon, I tried to recreate this sense of perspective in an abstract painting using Ecoline fluid watercolour and water-soluble crayons. I approached it by broadly interpreting the initial drawing as four shapes and then considering how light and shade played on the surface of each one. I widened the angle in the left foreground to create more of an entrance into the image. 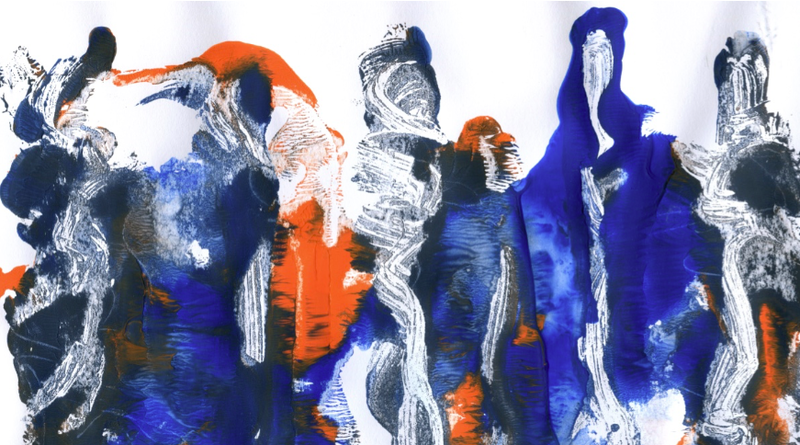 I was not trying to accurately represent the Wahrgang, rather I wanted to play with analogous complementary colours to create a harmonious image with a sense of light and movement. It is not a tidy picture but it does have a sense of movement towards something unseen in the distance. The light and shade on the roof timbers need attention but the whole thing has a reasonable light / dark balance and the diagonals on the floor carry the eye up the wall and around.